10 Hot Kickstarter Games to Fund Now | Nerd Much? The video game industry is an ever-growing, creative field that many gamers want to be a part of. Although we constantly wait for the newest, highly anticipated titles to release in stores or online, it’s worth noting that all developers have to start out somewhere. Many developers have amazing game ideas, but are set back by the outrageous funds it takes to make a game become reality. With crowdfunding websites like Kickstarter rising in popularity within the last few years, aspiring developers are given a chance for their projects to be funded by strangers who like their idea and want to support it. People who wish to support pick an amount to donate, tiers often containing special items related to that game/product. In indie games, platformers are a very common genre published by different developers. What makes a platformer stand out is if it has a unique twist on the classic style of gameplay, which Failsafe definitely promises in a parkour-style adventure. This game follows a curious girl named Isra who longs to explore the world around her after being raised to become a leader of her people, uncovering the stories of The Forgotten. Along with her robot companion, Isra must jump and swing through her expansive world. The developers mentioned that it was inspired by famous Japanese film maker Hayao Miyazaki’s works, and is to be played like the “better parts of Mirror’s Edge.” The art, voice acting, music, and overall atmosphere look absolutely amazing, and this game really deserves to be on our list of the best Kickstarter games right now. Doko Roko is a very interesting title, its retro-esque style with crisp, 2D vertical action combat bringing a completely unique experience to the table. Set in a mysterious tower, this title focuses on battling the various demons within the tower in fast paced combat that involves sword and magiks. Demons are also available to communicate with in the ecosystem inside the tower, which sounds like a unique element to the game itself. The style, combat, and overall feel looks great and is very promising for gamers looking for a fast-paced action title. Outer space is a setting commonly found in science fiction games, especially in major triple AAA titles such as Halo and Destiny. When a spaceship battle of nearly a hundred players is combined with a large atmosphere based on exploration, Infinity Battleship was born. It’s a new take on space themed games, focusing on ships rather than first person shooter gunplay. Players can choose from a wide range of ships and customizations. It promises to be a great experience for both solo players or those with a party of friends. The classic horror film being made into a horror game, Friday the 13th is a horror asymmetrical multiplayer game that has an interesting premise and style of gameplay. You may be thinking, how can a slasher horror film become a video game? In this title, players are put into a game in a 1 v. 7 setting. One character is randomly selected as Jason Voorhees, while the other seven are camp consolers who are trying to survive the night. The person who is Jason goes on a slashing spree while the others must figure out how to stop him. Not only does this sound really unique, it also sounds like a blast, especially for fans of the iconic horror movie. Watch the official Friday the 13th the game reveal here. Speaking of horror games, The Letter, another promising Kickstarter project appeals to those who are fans of the genre. A visual novel by Yangyang Mobile, The Letter promises to be a combination of a text-based adventure with jump scares, quick time events, psychological horror elements, an eerie soundtrack, character relationships, and more. Following the story of a mansion that is rumored to have a spirit, a letter is found that says “Help Me” five times, and must be sent to “five people or else”. From then on, the cast of characters are thrown into a life or death situation in which the player must decide how it plays out. Each member of the cast will be telling the story from their perspective. The art, music, and visuals are gorgeous. A demo is available for those who are interested. Historical games, especially shooters, are very limited and hard to come by. Living in a world with a vast history of wars and events, it’s surprising that there are not more games such as this. War of Rights claims to be one of the most historically accurate games about the American civil war to date. One of the goals that the developers stated was that they wanted to implement several Napoleon era battle tactics in the system.One thing that really stands out about this title is the connection to educators and teachers and video games. The developer mentioned that this title can be served as a teaching tool, while being a fun experience. It’s planned to be a multiplayer game with several, authentic maps. This game might be a great title for both teachers and students, as well as any history fanatic or shooter genre lovers out there. A Princess to Save Me, like the name suggests, is a complete twist on the damsel-in-distress trope commonly found in stories and video games. 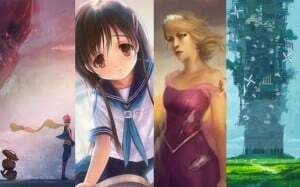 In these games, the prince has to save the girl, usually a princess, while she does nothing but sit and wait for her rescuer. This game reverses the role, which completely reminds me of Super Princess Peach (which totally deserved an entire series). Princess Amelia must fend for herself in a turn-based tactical role playing game format. Not only is it awesome that the roles are reversed, the gameplay looks fun and seems to be a promising title. Exploration games are usually always filled with unique and interesting worlds that are a joy to walk through. Song of the Firefly is a 3D-explorer, following the footsteps of Sam and Sarah, two of the last humans on Earth who must make it through a dangerous world. The game is said to mix 2D platforming mechanics with a 3D engine. It’s already Greenlit on Steam, and can be tried out in a preview via the Kickstarter page. Visual novels have recently been getting more and more of a presence in the West, especially hits that are being localized day by day. Narcissu is one of these titles that is hoping to be localized and placed into an anthology for gamers to enjoy. The story explores the relationships between the dying and living, and was a bit hit across the world, having several fan translations available. Although this game was already made, an official license and translation takes quite a bit of work, as well as adding additional scenarios and writing. Sekaiproject has had several successful projects like this that have brought exposure to several games from Japan to the West, and have several successfully funded projects on Kickstarter. Hopefully this next title will be funded, adding to the growing library of visual novels. The sequel to the Kickstarter funded Seduce Me, Seduce Me 2: The Demon War is set to provide a conclusion to the first storyline. The story follows main character Mika Anderson, who is set to be married to one of the five brothers from the first game, until she has to face a Rebellion and a war. Otome games, in which female protagonists are able to romance men, are finally gaining more of a presence in the west and should be supported. Since Seduce Me had a successful first title, the second is promising. What’s really awesome about this project is that a game that was once funded is being funded again through a sequel, giving hope to any potential developers who are unsure about starting a campaign.